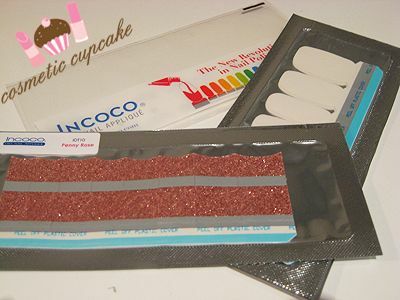 I was lucky enough to be one of the winners in Asami’s giveaway recently and I was able to try the Incoco Dry Nail Appliqué Penny Rose tips which I have been lusting over. I’m sure everybody has heard all about these but if you haven’t they are dry nail polish strips that can last for up to 2 weeks. I used to try and make my nail polish last as long as possible but nowadays I change about every 2 days! My nails had grown out and I didn't have time to do my nails this week so I thought it was the perfect time to try them out. 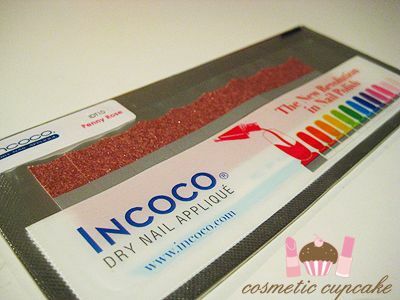 You get a strip of french tips and double ended clear strips in foil packages to keep them from drying out. I had a bit of trouble getting the hang of applying them at first but after a while it wasn't too bad just a little time consuming as it was my 1st time. I thought I had big fingers but most of the sizes were actually too big for my fingers! The clear polish strips were REALLY tricky to get on as they're really thin. I also put these on late at night so that may be a factor in why I didn't find them easy to put on compared to other bloggers who say they're a breeze! After struggling and getting mad at the polish, I decided I didn't like them much as they were such a pain for me to apply. THEN I woke up the next day and saw them in sunlight and just fell in love. I think they look fantastic and are so chic! I love the colour of Penny Rose glitter - does anyone know a glitter polish that is similar? The glitter is really packed and is totally smooth. I found they actually look better as the days go on! I guess they lose the rubbery sort of look that the clear top coat gives it. You can see in the pic below that the polish was too big for my fingers on the sides and it overlaps my cuticles. Got rid of it by using my nail polish corrector. I kept these on for 6 full days until I couldn't stand having my nails long any moment longer but they could easily have lasted for a couple more days. I subjected my nails to all sorts of abuse at work these last couple of days (carrying files, typing, dispensing etc) and not even ONE chip. Not one chip!!! They looked as good as the day I first applied them. I'm very impressed with the lasting power of these and I definitely want to try more of the glitter tips! They would be perfect for a holiday where you wouldn't get a chance to change polish much. wow those are so gorgeous!! 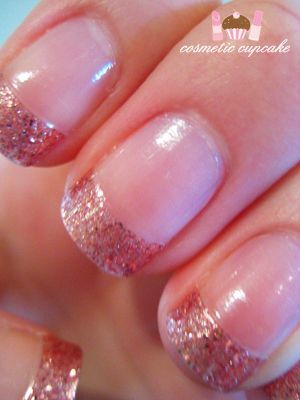 i love glitter tips....those nail strips seem very fiddly though! They look so great on you! I'm really glad you got that color! those are awesome looking! and six days is pretty impressive. Thanks, I'll definitely be buying these! Cool! I would have to give that a try! They look cool Chelle. I wonder if we can get them here anywhere?? @Penelope: Glad you like them! Just wish they were available in Aus. @Asami: Thank you so much for having your contest Asami! The penny rose tips are so so gorgeous hehe. @Jen: Thanks hun! They were worth the frustration of applying them. @Mistress Zombie: I still am so impressed with their lasting power. I'm sure they could have lasted even longer had I not gotten sick of my longer nails! @Jackie S and Meme: Definitely try them ladies! They look great but just take a while to get the hang of applying. @Carli: Thanks hun =) I believe they sell these under the name "Glam by Manicare" at Target here but they don't have any of these lovely glitter tips unfortunately. Link here: http://www.glambymanicare.com/pages/products/glam-nails/nail-enamel-strips/french-nail-enamel-strips.php. @Becky: Definitely try them out if you get the chance! They are very interesting.